The latest version of Firefox is hitting hard drives, with a host of new features specifically designed for the workplace – plus some powerful security enhancements you'll appreciate at home. 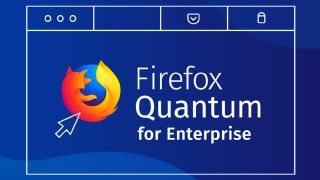 The business-focused Firefox Quantum for Enterprise now makes it easy for employers to customize the browser to meet their workers' specific needs – whether they're using Windows, Mac or Linux. Businesses can deploy either the standard Rapid Release, which receives updates every six weeks, or the Extended Support Release, which gets all the new features in one big annual update (in this case, Firefox 60). That doesn't include critical security updates, which both versions receive immediately. There's plenty for home users, too. Following its debut in last month's beta release, Firefox now supports Web Authentication (WebAuthn), making it possible to log into sites without a password. At the moment it only supports USB devices (such as Yubikey) but future releases will add support for mobile devices and biometrics as well. These can either replace standard passwords completely, or work as a form of two-factor authentication. Its main purpose is to defend against phishing attacks, though if could also be handy if a site accidentally exposes millions of users' login details in plain text. Ahem. You'll notice something different about your new tabs too, with a wider layout that includes Search, Top Sites and Highlights, making it easier to reach the content you want.